Genero 2.1 – support for multiple dialogs mid-year, greatly enhancing developer productivity for the creation of sophisticated forms driven applications. Genero Studio 2.0 – improved ergonomics and the introduction of a wizard driven application generator. 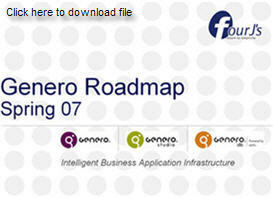 Genero Report Writer 1.0 – makes its entrance at the end of the year as an alpha release with General Availability in the first half of 2008. Genero db 3.8 – improved compatibility with Informix, Oracle and PostgreSQL.